Originally built in 1964 and fully renovated in 2013, Old Pate Chapel offers a graceful and elegant space for exchanging wedding vows or celebrating other sacred occasions. Accommodations include dressing rooms for the bride, bridesmaids, groom, and groomsmen, as well as a new sound and light system. Completed forms must be turned in, approvals must be received, and all fees must be paid prior to the day of the event. 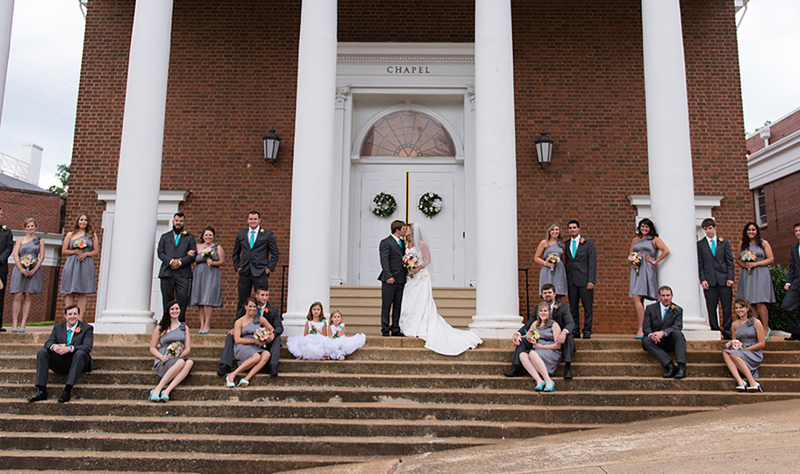 Rental of either Old Pate Chapel or the Worley Prayer Chapel includes access to the facilities two hours the day before the ceremony for a rehearsal and four hours on the day of the wedding. The Liberty University Events Office will assist you with the scheduling details for your wedding. You may contact the University Events Office at (434) 592-3511 or events@liberty.edu. A facility coordinator will be on-site the day of your event in order to unlock and lock the facility, protect the interests of the university, and ensure that all policies and regulations are followed. Liberty University does not provide wedding coordinators but can make recommendations regarding coordinators in the area. The applicant is responsible for providing and removing all decorations, wedding materials, and personal items. Items must be removed immediately following the event. All trash must be placed in trashcans. The applicant is responsible for any damage done to the facility, including any damage done to decorative items, furniture, or fixtures. All candles must be dripless, unless contained in a glass container. Pew candles (with pew clips) or window candles may be used only if enclosed in a protective globe. All candles must be extinguished immediately following the ceremony or after pictures. Please note: the applicant is responsible for the removal of waxy residue, as well as any damage caused by the use of candles. Nails, staples, tacks, or tape may not be used on any surfaces. You may use ribbon, rubber bands, and/or Command™ strips. If you have questions about the use of a product please contact the University Events Office. Live flowers are not permitted to be dropped by the flower girl due to potential damage to the carpet. A protective covering must be placed under all candles, plants, and flowers. Live flowers and dried flowers may be thrown outside of the facility; bubbles may also be used. The use of rice, birdseed, or sparklers is prohibited. Alcohol is prohibited on all Liberty University premises. Liberty University reserves the right to make its facilities available only for weddings and other ceremonies that are not inconsistent with the religious mission, doctrinal statement, and policies of the university. Neither Old Pate Chapel nor the Worley Prayer Chapel is available on Sundays. Rental of Old Pate Chapel includes the use of the facility’s sound system as well as sound support provided by a Liberty technician. All requests for sound support must be noted on the request form. Rental of the Worley Prayer Chapel includes the use of the built-in sound system. All requests for sound support must be noted on the request form. Outside sound equipment is not permitted in either facility. All wedding parties must provide a certificate of insurance. Additional information regarding insurance requirements will be provided by the University Events Office. For pricing information, please contact the University Events Office. Located in the former Donald Duck Soda bottling facility, The Bottling Co. offers guests a charmingly vintage venue for weddings or social events. Rental of The Bottling Co. includes nine hours of use. All setup and cleanup must be completed within this timeframe. The Liberty University Events Office will assist you with the scheduling details for your event. You may contact the University Events Office at (434) 592-3511 or events@liberty.edu. A facility coordinator will be on-site the day of your event in order to unlock and lock the facility, protect the interests of the university, and ensure that all policies and regulations are followed. All candles must be dripless, unless contained in a glass container. Please note: the applicant is responsible for the removal of waxy residue, as well as any damage caused by the use of candles. Any equipment brought into the facility must have protective coverings so as not to damage the wood floors. This includes, but is not limited to, catering equipment, DJ equipment, and decorative items. The Bottling Co. is not available on Sundays. Alcohol is prohibited on all Liberty Univeristy premises. Rental of The Bottling Co. includes the use of 5-foot round tables, 8-foot rectangular tables, banquet chairs, and the setup/teardown of the tables and chairs. Caterers must be preapproved by the University Events Office prior to use of the facility. Caterers must provide proof of insurance and a valid business license. Rental of The Bottling Co. includes the use of the sound system and screens/projectors. All requests for sound support must be noted on the request form. Any outside sound equipment must be preapproved by Liberty University’s Event Productions Office. If an Event Productions sound technician and/or any other equipment is required, this may result in an additional charge. If a band and/or DJ is used, they must provide proof of insurance. Brides may enjoy walking down the aisle in the recently renovated Worley Chapel. A historic campus landmark, the prayer chapel provides an intimate setting for your special day. Accommodations include dressing areas for the bridal party and the use of a built-in automated sound system.